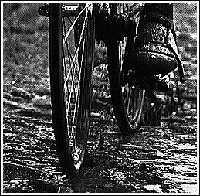 Born in the era when races were publicity machines for sponsors, Paris-Roubaix is one of the oldest one-day races and celebrated its centenary in 1996. Since the demise of Paris-Bordeaux, it is the only modern-day race which truly echoes those times around the turn of the century when the heroic marathon endeavours of racing cyclists captured the imagination of the public across Europe. To many this is the Queen of the classics - its character coming from the sections of cobbles towards the end of the race, usually totalling around 65 kms of the 265 kms route, that batter the riders into submission. Only a very strong rider will win on the velodrome in Roubaix. Luck, and the weather, play an influencing role on the race. Many riders have their chances ruined by a plague of punctures, or by being held up behind someone else's crash. There is the argument that if you want to win you have to ride in the front 6 on the cobbles but even so there is still a great element of chance. Not for nothing is the race known as "The Hell of the North". Now France's sole one-day classic, in recent years the French fans who line the route in their thousands and pack the stadium in Roubaix have had little to cheer bar Duclos-Lasalle's wins in 1992 and 1993. But cheer they do, and any rider managing to finish this magnificent race can expect a warm welcome at the finish. Here are some links to the official race site which will be of interest to Paris-Roubaix fans.